"Amazing Profits from Communications Technology"
– that’s the sort of headline we like. It’s what we help our clients achieve. As we often say: “It’s not about the technology” but in a sense it is… it’s just we show you how to use it to INCREASE your bottom line, rather than what often happens with telcos; money flowing the other way. After in-depth discussions to help us understand how your business works, we usually recommend only two or three of the following, tailored to your exact needs. The ones that will enhance profits in your particular situation! We can often “bundle” services to lower your costs further. 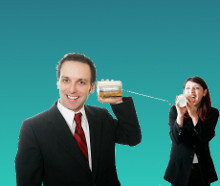 VOIP | Voice-Over-Internet-Protocol: It’s what the big companies use so all calls are local calls. Virtual PABX | Forget about expensive up-front costs and ongoing maintenance. We manage it all from a central location for you. In most cases the phone system (or lack of one) that you have now is all you need. IVR Menu | Interactive-Voice-Response: Enquirers can listen to pre-recorded information, then choose to speak with a human, or record a message, or even listen to further information. Line Hunt Dialer | Calls are routed to numbers selected by you, in the order you want. For example: if reception is busy, it goes to sales; If one geographic location doesn’t answer, it goes to another, even a mobile. Postcode Selection | Caller enters postcode, and their call is directed to your nearest business location. Fax-to-Email-to-Fax | Receive and send faxes from any internet-connected device that emails or uses the web. Yes, get faxes on your phone or tablet as well as in the office. Send in multiple formats, multi-page faxes if you wish. Receive as PDF or TIF attachment. Voice-to-Email | Callers leave a message which is sent to your email account as a sound file. Excellent for business people on the move, and a handy record of the callers message that can be filed away. Web-to-Fax | Send a fax from an internet browser. Works with computer, smartphone, tablet. Most smartphones will take pictures and convert to a PDF that can be sent to a fax machine. Even Jpeg files work (but on the other end there will only be a black and white fax machine usually!) Great for getting that signed document to where it has to go while you are still in the field. Live Answer | One of our most-loved services. Real live Australian people answer in your company’s name. This can be integrated with the above services, so a caller can call a 1300 number, choose to listen to your sales message, then after qualifying themselves they select to talk to a real person, who has a list of further qualifying questions to ask them. The answers are recorded and sent straight to your email and/or SMS. And our guys’n’gals are working 24x7. It’s high-quality lead acquisition on steroids! But look folks: you don’t have to know ANY of this. As I said above, we talk with you until we understand how best to help you, then implement whatever is needed to increase your sales and/or lower your costs. Speaking of costs, these days you can have high-end services like the “big boys” for a very moderate outlay. Most of our clients are surprised at the low investment. Interested? Call us or use the contact form on this page to schedule a discussion. It will be the start of better times for your business.